Defend Kurdish and Turkish Teachers! The League for the Fourth International intervened with a leaflet containing the following article, in Italian and English, at a national demonstration for Kurdish rights of over 3,000 people held in Rome on September 24. An all-out assault on teachers in Turkey was launched on September 8, when 11,285 were suspended by the authoritarian government of President Recep Tayyip Erdoğan and his AKP (Justice and Development Party). It’s imperative that class-conscious unionists and all defenders of workers’ rights come to the defense of Turkey’s teachers and the embattled Education and Science Workers’ Union, Eğitim-Sen. The leftist union, the largest in Turkey, has been under constant attack by the rightist, Islamist AKP regime for over a decade, and before that under the military-backed government. Now, it appears Erdoğan wants to finish it off, by wholesale dismissals. The government has already been using the failed coup of July 15 to purge perceived political opponents and those deemed not loyal enough to the would-be Sultan Erdoğan. The botched coup was blamed on supporters of Islamist rival and former ally Fethullah Gülen, who since 1999 has been in self-imposed exile in Pennsylvania. Gülen runs a network of charter schools in the United States and an empire of over 1,300 private “Hizmet” schools and religious academies (madrassas) in Turkey and in Islamic countries from Bosnia to Somalia and former Soviet Central Asia, where he has been accused of working closely with the CIA. But the government has used the crackdown on Gülen supporters in order to eliminate all other opposition forces, particularly Kurdish and some leftist organizations. Within two days of the coup attempt, the Education Ministry fired 15,000 education workers and revoked the teaching licenses of another 21,000 educators in private schools, as well as arresting thousands of military officers and police. On September 19, the first day of school, a deputy prime minister announced that in the last two months the government had fired 27,715 teachers and another 9,465 remain suspended. Altogether over 80,000 government employees have been sacked and tens of thousands jailed by the AKP regime, which not only targeted alleged Gülenists but also picked up some Kemalists 1, purging the state apparatus with relative ease, and which is now going in for the kill against Kurdish groups and militant trade unionists. The September 8 suspensions, ordered by the Education Ministry under a state of emergency decree, were for supposed “connections to a terrorist organization,” by which the government means the Kurdistan Workers Party (PKK). The dismissed educators were largely from Turkey’s southeast, where a majority of the population are ethnic Kurds. The region has been a theater for brutal government repression against the Kurdish population since July of 2015, including cordoning off entire neighborhoods under police occupation. On the eve of the assault, the government ordered thousands of teachers from western Turkey to leave Cizre and other cities under attack. In the ensuing months there was virtual urban war with residents raising barricades. Now, as punishment for this resistance the government is threatening to fire Kurdish teachers. In conjunction with the latest teacher suspensions, Erdoğan proclaimed “the largest operations against the PKK terrorist organization in its history, both within and across our borders.” The PKK has for over four decades waged a guerilla struggle originally for independence, and more recently for autonomy for Turkey’s Kurdish population. With over 40 million native Kurdish speakers, this is the largest national group in the world without a state. At the end of August, Erdoğan ordered the invasion of northern Syria by the Turkish Army. While ostensibly directed against the Islamic State (I.S. ), it was actually to prevent the extension of an autonomous Kurdish region in Syria and to smash Kurdish resistance in Turkey. In its full-court press against the PKK, Erdoğan has given the Gülen treatment to a vast array of Kurds. Those who do not distance themselves from the militant group will have their careers destroyed at the very least. Under a series of decrees issued on September 1 firing up to 50,000 civil servants, those affected cannot be employed by any government agency, will be thrown out of public housing and have their passports invalidated (BİRGün Daily, 2 September). Many could languish in prison for years. Teachers in Diyarbakir province, in the heart of the Kurdish region, where over 4,500 education workers were dismissed, protested by the thousands on September 9. They were brutally dispersed with water cannon and 30 arrested. More recently, the teachers petitioned educational department officials to rescind the firings, but their petition was dismissed (Evrensel, 21 September). Going back to the 1970 labor law, Turkish governments have taken aim at teachers unions. The militant TÖB-DER teachers solidarity association was dissolved after the 1980 coup, and a number of its members tortured and killed. The current teachers union, Eğitim-Sen, part of the KESK (Confederation of Public Employees’ Trade Unions), has long been targeted by state repression. Founded in 1995, it has some 200,000 members and is one of Turkey’s largest trade unions. In 2004, the AKP government attempted to ban the union for defending the right of students to receive education in their native language (i.e., Kurdish), outlawed under Article 24 of Turkey’s constitution. While the European Court of Human Rights ruled in favor of Eğitim-Sen in 2009 and again in 2012, that year 25 leading members of the union were sentenced to prison terms of over six years on trumped-up terrorism charges. This time around, the government is making up its purge list from names of teachers who participated in a work stoppage last December (Sendika.org, 8 September). That strike protested the October 2015 bombing of a rally where over 100 demonstrators were killed as they called for peace in the southeast and an end to the anti-Kurdish repression. 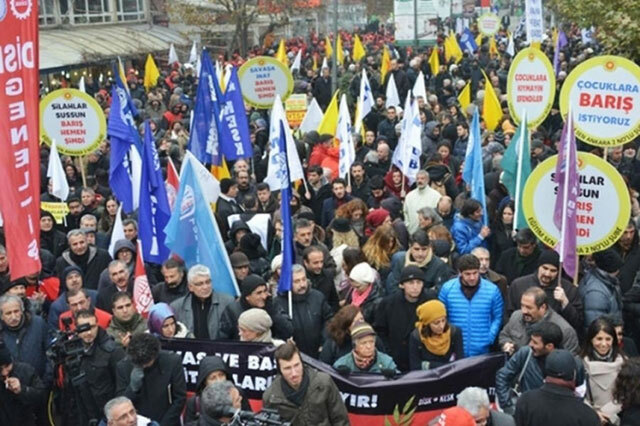 The October 10 rally was organized by the KESK, the DISK (Confederation of Progressive Trade Unions) and the HDP (People’s Democratic Party), a pro-Kurdish bourgeois liberal party that the government labels an extension of the PKK. HDP deputies have since been stripped of parliamentary immunity and their leaders face five years in jail for calling for autonomy for the Kurdish region and allegedly spreading pro-PKK propaganda. Now, at the same time as the teacher firings, two dozen democratically elected HDP mayors were ousted over alleged links to the PKK and replaced by government flunkies (“Ankara hardening anti-PKK strategy,” Al-Monitor, 12 September). Erdoğan’s war on the Kurds and unions has shifted into high gear. The League for the Fourth International has since its inception called for a socialist republic of united Kurdistan. The LFI defends the PKK against the Turkish state and calls for the release of its leader, Abdullah Öcalan, from Turkish prison2 . We do so from the standpoint of proletarian internationalism as opposed to the nationalism of the ex-Maoist PKK. As Leninists and Trotskyists, we defend the right of Kurdish independence, not only autonomy (which would still leave Kurds under the heel of the Turkish state). We call on class-conscious workers in Turkey to mobilize their power to demand that the Turkish army get out of Syria and end the murderous police and military repression in Turkish Kurdistan. 1. Followers of the secular tradition of Mustafa Kemal Atatürk, the founder of the bourgeois Turkish republic. 2. See “Free Abdullah Öcalan Now! Down with the Ban on the PKK!” The Internationalist No. 7, April-May 1999.